Seems Google is enhancing and adding lots of new features to every Google Product. Few days ago they added Undo feature in Gmail and now good news for the AdSense publishers regarding payment calculations. Google has added a new layer of transparency for the AdSense publishers. They have added a separate column in the report where you’ll find the deduction made by AdSense due to invalid activities. With this feature, Publishers will get a clear picture about the deductions. AdSense payment was a matter of debate since beginning as the earning it shows and the one publishers get differs and people keep on asking what this difference is. Now with this feature, AdSense has succeeded to make it transparent up to much extent. Invalid activities can be due to multiple reasons like the accidental clicks, invalid traffic (includes adult traffic, bot traffic etc. ), automated clicking tools or any such related activities. 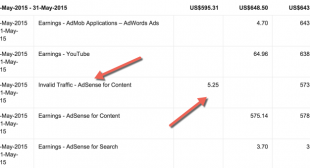 Google is not charging to their advertiser and so they don’t pay to the publishers as well. 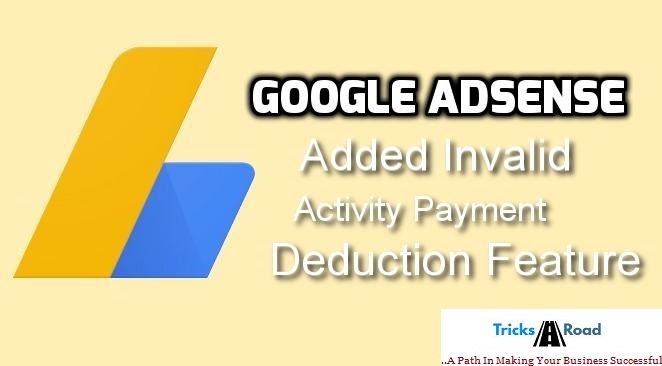 From May’15, you will find a separate section in your AdSense report named “Invalid Traffic” and it will show the deduction. You can see the report for one of the site below. This will enable you to know the exact money you would be receiving for that month from AdSense, due these all feature itself AdSense is still know as one of the best method of monetization.